With Blue Beetle: End Game, outgoing John Rogers perfects a somewhat familiar pattern we're beginning to see in superhero comics of late: that of a reborn or legacy hero who discovers a new aspect of their already-established powers, and therefore ties together and becomes a greater sum of their previous parts. Witness Stars and S.T.R.I.P.E, for instance. Witness Green Lantern: Rebirth. And witness this latest chapter of Blue Beetle, which in essence brings to a close the book's first twenty-five issue storyline. The original Blue Beetle Dan Garrett, Rogers posits, had the potential for superpowers but not the ability to access the alien beetle scarab's intelligence database; Blue Beetle Ted Kord had the intelligence, but was prevented from utilizing the scarab's powers. Enter therefore Jaime Reyes, the first Blue Beetle with both powers and the ability to communicate with the scarab; Jaime becomes not an aberration, but the culmination of the untapped potential of all the other Blue Beetles so far. To be sure, Rogers's revisionist history plays fast and loose with what was actually established in Blue Beetle series past, but the effect is to tie together all the former Beetles -- perhaps even to create a Beetle legacy where there wasn't one before. And the places where Rogers gets creative with the "facts" are balanced out by just how reverent the story is to Jaime's predecessors, Ted Kord especially. Indeed, the book brims with shout outs to the former Justice Leaguer -- including a fantastic costume change for Jaime late in the game -- such to firmly tie the most recent and newest Beetles together. End Game finds Jaime in his final battle against the alien Reach that both created the scarab, and intends to enslave the earth. Rogers finishes not just the Reach storyline here, but also brings to close threads dealing with Jaime's friends Brenda and Paco, the villain La Dama, the Posse, and others. Rogers also redeems some seemingly villain-of-the-week stories that I felt bogged down Blue Beetle: Reach for the Stars by showing how even insignificant moments factored into the Reach's ultimate plans. As Rogers leaves the book, he leaves it so cleanly that the reader is left with the sense, as I mentioned before, as if the first four volumes of Blue Beetle are one long, engaging story. The teen superhero genre is a troublesome one for the adult reader -- a well-done story can be groundbreaking, like Geoff Johns's initial run on Teen Titans, while Stars and S.T.R.I.P.E was ultimately too juvenile for my tastes. 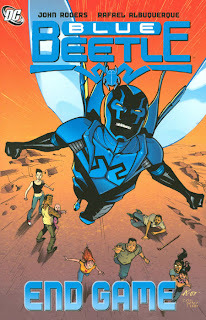 Blue Beetle is teen superheroics done right -- a book where the protagonist is neither too adult nor too immature, but rather demonstrates what it means to be a hero through the eyes of someone still learning. As I've mentioned in past Blue Beetle reviews, Jaime Reyes is just so earnest that it's hard not to like him, and it remains true here. Blue Beetle is a fine example of teen superheroics in the tradition of early Chuck Dixon Robin, and I hope the next team to take over keeps up this level of quality. We'll follow Blue Beetle around the DC Universe for a while now, with Teen Titans: On the Clock coming up next. "Blue Beetle Ted Kord had the intelligence, but was prevented from utilizing the scarab's powers." I feel is accurate only if you count Ted's own choice as "preventing" it. I'm sorry to see this series go, myself, but I guess it was inevitable. I don't read trades, I only buy trades of singles that I loved, and this storyline was easily my favorite of 2008. The way that the character is written and the story unfolds is both epic and understandable. This is one series that I am going to miss after next week's final issue. I cant wait to see what you have to say after the whole series is collected and complete. Not to knock the book, I haven't read it and I have enjoyed the series from what I've read, but I hope nothing ever gets titled End Game ever again. What a cliche, overused title. The scarab tried to join with Ted in his solo Blue Beetle series, Anon? In the series itself, or just according to the Jaime Reyes Blue Beetle series? Can you tell me the issue; I'd like to go check that out! It was when Ted fought Dan Garrett. So, around (but maybe not inside) issue 18. 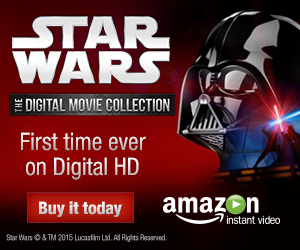 Sorry, the link didn't come through. If you go to Mile High's site and search for Blue Beetle, it's the series without a date in parentheses. Here I thought John Rogers made most of the scarab lore up. Interesting stuff; I'd love to read a Showcase Presents Blue Beetle.